Zimbabwe 162/4 in 20 overs (Solomon Mire 94; Hussain Talat 1-10) lost to Pakistan 163/3 in 19.1 overs (Fakhar Zaman 47, Talat 44) by seven wickets. 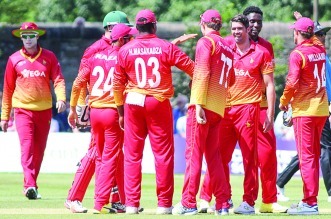 SOLOMON Mire broke Hamilton Masakadza’s record for the highest individual score by a Zimbabwean in T-20 cricket, but it was all in vain as the hosts crushed out of contention for a place in Sunday’s final with a seven-wicket defeat to Pakitan at Harare Sports Club, who will tussle for silverware against Australia at the same venue this weekend. Mire, who was named man of the match, hit 94 runs from 63 balls and surpassed Masakadza’s record of 93 not out. Masakadza also has couple of 79s on that list while Brendan Taylor’s best of 75 is also up there. Zimbabwe needed to win yesterday to retain their interest for the final but the defeat quashed any hopes. Australia and Pakistan have both amassed eight points ahead of their meeting at Harare Sports Club this morning, while Zimbabwe are still winless after three matches. Zimbabwe will play their last match of the series against Australia at the same venue tomorrow. Yesterday, Zimbabwe sought an improved performance following heavy defeats by the two cricket giants in their opening matches. The previous day, Mire had talked about Zimbabwe batters getting the starts and failing to cash in. Yesterday, he did manage to cash in with his entertaining knock which, however, came in front of a sparsely populated stadium on a chilly morning. A century was there for the taking but he might rue the missed opportunity as he could have kept his wicket longer. Cephas Zhuwawo was Mire’s new opening partner yesterday after Chamu Chibhabha had been dropped. The explosive batsman played true to character after Zimbabwe had been sent in to bat. He hit 24 runs from 26 balls before he became Pakistan’s first scalp. Zimbabwe continued to accumulate steadily keeping their wickets after Masakadza fell early for two runs and Tarisai Musakanda made 33 from 22 while Elton Chigumbura (5 not out) and Malcom Waller (0 not out) saw out the overs with Zimbabwe finishing on 162 for 4. The few fans in the stadium braced themselves or a possible win but Pakistan looked comfortable in their chase which they accomplished with five balls to spare. They lost Fakhar who scored 47, Haris Sohail (16) and Hussain Talat (44). Safraz and Shoaib Malik remained unbeaten on 38 and 12 respectively. Mire, Wellington Masakadza and Chris Mpofu shared the three wickets. Hamilton said that the team should have got about 15 more runs. “It was a much better performance today and we are pleased with that. But I thought we could have done better in the final overs of our batting and in the end we were about 10 to 15 runs short.